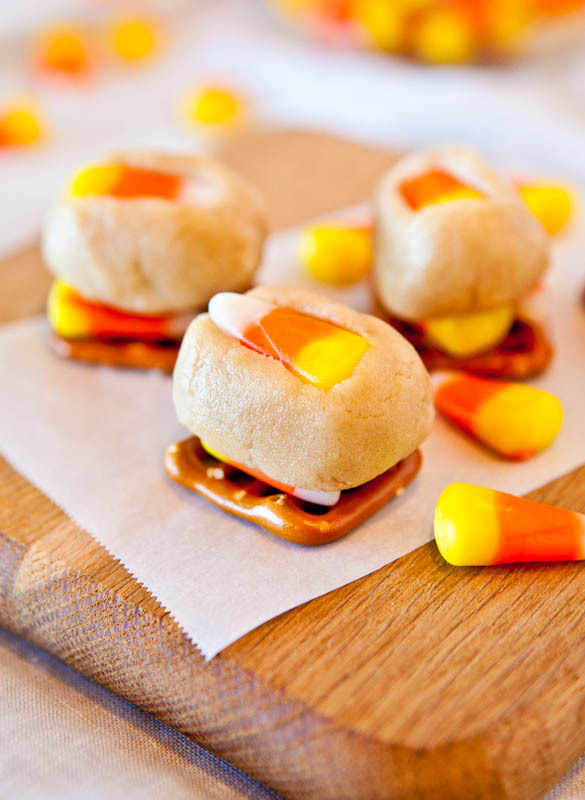 Last year about this time I made Candy Corn and White Chocolate Cookies. Until I posted them, I never knew just how much people love candy corn. I know it’s a love-it or hate-it type of food but for those who love it, you’re going to flip for the bars. They’re super soft, slightly chewy, and buttery. The candy corn stays chewy after it’s baked and the contrast of the dense, moist, tender bars against the chewy candy corn is great. 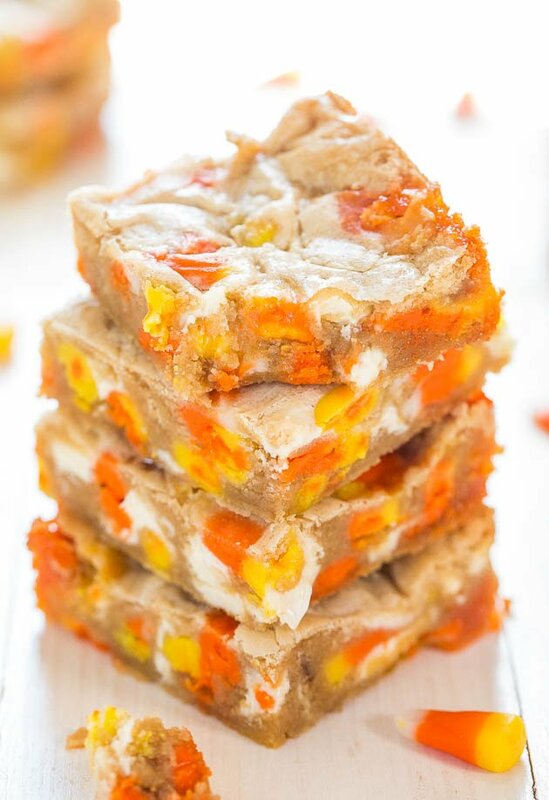 Throw in some melted white chocolate, and candy corn lovers are in for a real treat. When I want an easy, fuss-free recipe that I know everyone will love, I call upon my trusty blondie base. With 25+ versions and counting, it never lets me down. For this version, add 1 cup candy corn and 1 cup white chocolate chips. 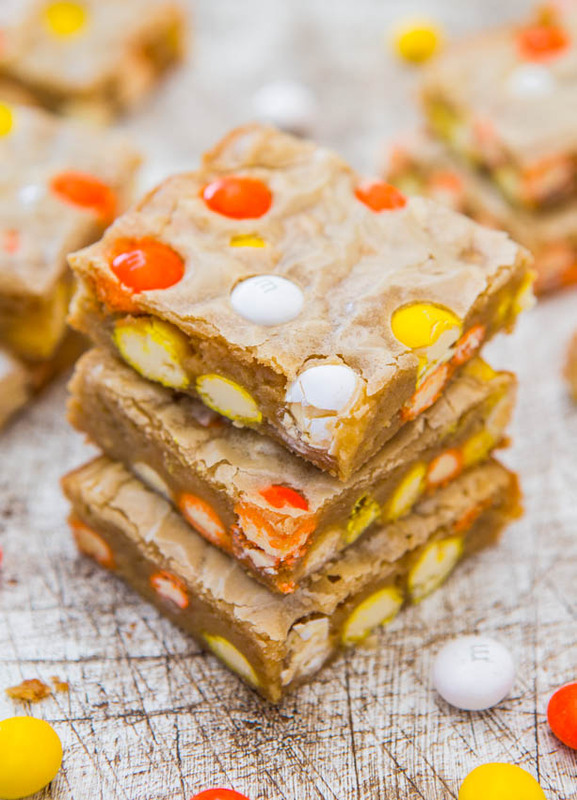 Ironically, I have a recipe that’s almost identical except that it uses Candy Corn M&Ms. Totally forgot about that one until after I made these. My 7 year old daughter loves, loves, loves candy corn. I didn’t even know how much until we were walking through the grocery store a few weeks ago and she exclaimed, “Mom, CANDY CORN! They have it!” That was my subtle clue to pick some up and get to work. Why just eat it when you can bake it into bars. She was very glad I did. The blondies are super soft, slightly chewy, and buttery. The candy corn stays chewy after it’s baked and the contrast of the dense, moist, tender bars against the chewy candy corn is great. 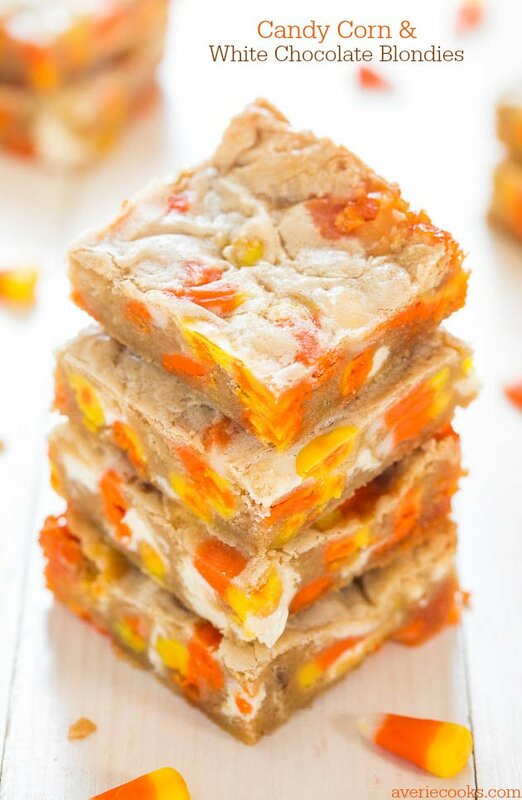 Throw in some melted white chocolate, and candy corn lovers are in for a real treat. It’s an easy, fuss-free recipe that’s easy to memorize because everything is “one”. The bars are a great way to use up any lingering Halloween candy. Stir in the candy corn and white chocolate chips. Turn batter out into prepared pan, smoothing the top lightly with a spatula. Very Important Tip – Avoid have candy corn touching the sides of the pan on the top surface because it will be prone to melting and turning into bubbly orange goo. Bake for about 22 to 26 minutes, or until done. Tip – In the final 5 to 10 minutes of cooking, optionally cover pan with a sheet of foil to prevent top surface from browning as quickly and any exposed candy corn from scorching. I didn’t find it necessary, but ovens and ingredients vary. A toothpick inserted in the center should come out clean, or with a few moist crumbs, but no batter. Allow blondies to cool in pan for at least 1 hour before slicing and serving. Blondies will keep airtight at room temperature for up to 1 week, or in the freezer for up to 6 months. These didn’t turn out for me :( maybe I baked them too long, I added about 10 minutes because my tooth pick came out runny each time. 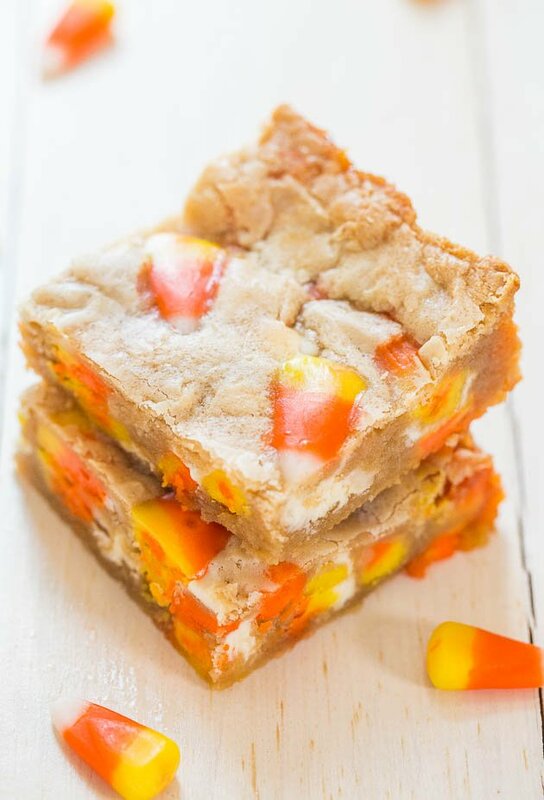 I think it’s because the candy corn melted inside the blondies. I’m going to try a 2nd batch…(I will say the gooeyness still tastes awesome)! They didn’t turn out for me either! I think the problem with this recipe is it needs a cooler temp like 325 and self-rising flour with everything in the recipe doubled but the candy. I am going to try it my way bound to be better than this recipe. There isn’t a problem with the recipe and I do not recommend baking at a lower temp and definitely don’t recommend self-rising flour – that will turn them cakey and that’s not what blondies are. The issue for many is that they allow the candy corn to be placed at the bottom or edges or the pan and it melts. Easy to avoid since the pieces are big and easy to reposition into the center of the pan or away from edges/base. Just want to say this recipe is perfect. I have made it several times. Only changes I make is that I cream room temp butter and sugar (rather than melting) Add the egg, vanilla and follow rest of instructions. And I use parchment instead of foil. The KEY is carefully moving all candy corn away from the edges. Hope this helps. It is one of my family’s favorites this time of year. You hit the nail on the head: The KEY is carefully moving all candy corn away from the edges. <--- Totally agree! Glad you love this recipe and that it's one of your family faves this time of year! Made these yesterday and was so excited. I know they are cooked but they taste raw. I didn’t care for them but my daughter loved them because she loves raw cookie dough. All ovens, climates, pans, etc. vary and you definitely want to cook through until they are done, whatever that means given your variables. Not sure if they are still raw? or you just think they taste raw. I don’t find them to taste raw at all once cooked fully. Thanks for trying the recipe and if you have any doubt that they’re still raw, throw them away now and just cook a bit longer next time. Well it should be cooked, I cooked them for a good 10 -12 extra minutes. I think it was just all the candy corn. Maybe next time I would add less or just use chocolate chips. Ok then they’re not raw. And as you said, you can use less candy corn or choc chips next time. These are a kid favorite type of treat for sure! Can this recipe be easily doubled and made in a 9×13? Have you tried this? Any idea on time adjustment? I made the regular recipe and loved it. Want to send a big batch into work with my husband and was hoping doubling it will work. I have only made as written but doubling in a 9×13 shouldn’t really need more time but keep an eye and bake accordingly. I made these at the request of a friend (harder to find candy corn at Christmas time lol). The recipe is good, though I did try the suggestion of room temp butter and it seemed helpful. Also, a tip I tried for those having a hard time keeping the candy corn away from the bottom and sides (this is my second time making these and the first time all the candy corn melted even though I did try). I mixed in the white chocolate, then put a thin layer of better in the bottom of the pan. Then mixed in the candy corn and put the rest of the batter in the pan with more batter towards the center, as this batter spreads when it bakes. It came out PERFECT. Maybe one melted candy corn. They were great. Great tips and glad these are a winner for you! I’m sure the tips will help others, thanks for sharing! 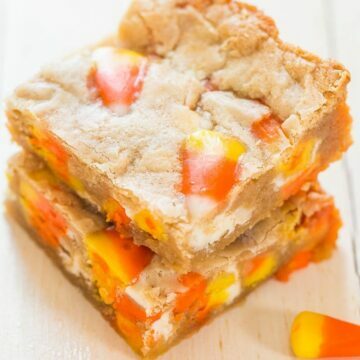 I tried doubling this recipe in a 9×13 pan and since it took nearly twice as long to bake, the candy corn melted throughout and became weird red goo :( So it seems best to make it in separate batches! Anything with candy corn definitely I recommend keeping it in smaller batch sizes because yes when it’s exposed to heat, it will melt and the colors will break down as it melts. I made these for the office for Halloween and they turned out perfect. I’m being cursed by the rest of my office mates every 5 minutes! I followed the recipe as written but after reading other posts made sure that I kept the candy corns away from the edges. I’d for sure make these again. Thanks for the five star review and I’m glad you love the cookies! Yes definitely keeping the candy corns away from the edges is the way to go. Glad things are a hit with everyone in your office!